This is the food given to an average family. We supplement this minimum when we have enough supplies. These are some donated food items from one of our supporting partners, the local Rotary Club. You can donate food through them by clicking here. Two of our volunteers work to distribute canned vegetables as we pack Thanksgiving Dinner bags for Plainfield families in need. Our Holiday Dinner Project serves 160 to 170 families of all sizes every Thanksgiving, Christmas, and Easter. Each family receives a frozen turkey or a canned ham, depending on the holiday, plus all the trimmings needed to make it a special holiday dinner. Pantry shelves can very quickly become bare when donations slow. You can help by donating food whenever you shop for groceries. Just add a few items from our Shopping List page and drop them off or email us for a pickup. 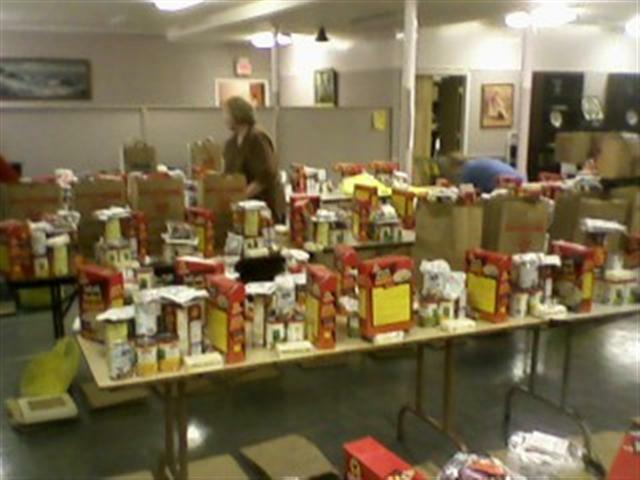 The Rotary Club of Plainfield-North Plainfield donates enough food (pictured above) each holiday for twelve families. Cases of food are lined up and waiting for volunteers to begin spreading them out for family dinners. Each family gets four tea bags in a little baggie. They don't just jump into those baggies - three helpers make that happen. Some of the hundreds of toys donated by Wilson Memorial Church, VIP Honda of North Plainfield and by St. Helen's Church of Westfield. Local 423, Utility Workers Union of America, representing unionized men and women at American Water Company in our area, donated $500 to our 2013 Christmas Holiday Project. Two sizes of hams were available - three pound and five pound - and were distributed based on family size. Volunteers add the finishing touches to the piles of food waiting to be packed in the grocery bags on the floor. All those boxes of food get recycled when empty. Two of our workers are busy prepping the boxes for bundling.